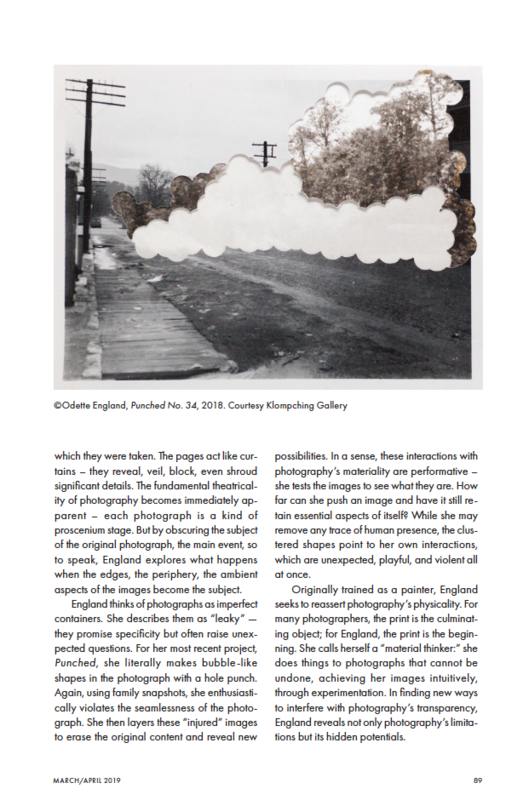 We’re delighted to share this wonderful interview with Odette England, by Mark Alice Durant, for the March/April print issue of Photograph. The In The Studio feature, is published ahead of the artist’s upcoming solo exhibition at the gallery. Entitled, The Outskirts, Exposed and Punched., the exhibition opens with an artist’s reception on Thursday, March 21st, 6:00–8:00pm. Collector’s wishing a preview of the artworks ahead of the opening, should contact Debra Klomp Ching. Also, a Collector’s Salon will be hosted by the gallery on Saturday, April 6th.